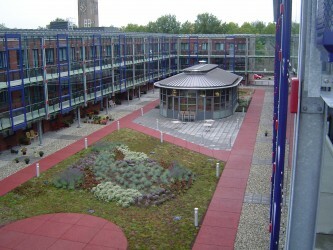 Green roofs and living walls are a booming business in the Netherlands. 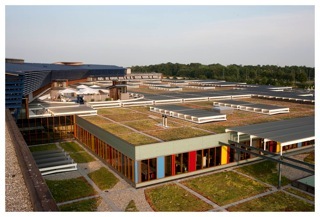 Many respected architects integrate green roofs in their designs as a common practice. 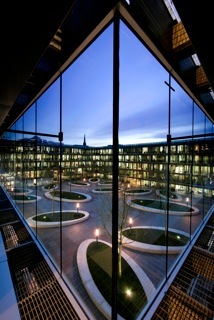 Project-developers and housing associations also see the benefits. Specifically the multiple uses of space is beneficial where space is limited, which in the Netherlands often poses a challenge. This development has been ongoing since the early eighties and has really taken off in the last 10 to 15 years. The grants for each city are regulated by the municipalities themselves. There are no national regulations as yet. This has resulted in an array of different regulations: availability of grants, allowance per square meter and basic requirements are different for each city. The minimum allowance lies at € 25,- per square meter, the maximum at € 50,- per square meter, and often it is limited to half of the total cost of installation. The basic requirements also vary; some cities require an extensive application with structural drawings and calculations, others demand that the green roofs meet certain water retention criteria. So far they have received applications for over 30.000 square meters of green roofs. 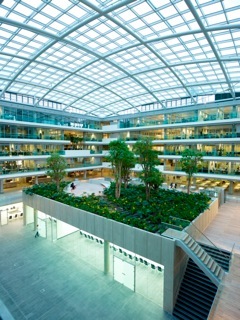 Their aim is to have a total of 800.000 square meters of green roofs by the year 2030. The national government does have a regulation for entrepreneurs, consisting of a tax relief scheme for environmentally friendly investment (Vamil and MIA). The MIA scheme, offering a tax refund on environmental investment, and the Vamil scheme providing for voluntary depreciation on environmental investment, are two different schemes run by the Ministry of Housing, Spatial Planning and the Environment, or VROM for short, and the Ministry of Finance (the names of these ministries will change in 2010). The aim of both of these programmes is to encourage Dutch entrepreneurs to invest in their business operations in an environmentally friendly way. The Dutch are well-known for their outstanding architecture and have countless green buildings. Urbanisation of the Netherlands is a factor to be considered in many ways, creating opportunities for innovative products. As such the Dutch government is actively helping innovation and supporting the industry. Albert Jan Kerssen is product manager Roofgardens & Living/Green Walls at ISS Landscaping Services in the Netherlands, one of the largest landscaping companies in the country. He has engineered and managed the realization of high-profile and extreme technically challenging projects, unmatched in the Netherlands. Unique is his experience in Public-Private-Partnership (PPP) building projects. PPP-projects form a challenge in itself, considering the company’s responsibility for these projects between 20 to 25 years. He is also board member at the department Roofgardens & Living Walls at VHG Branchevereniging, the Dutch landscaping association. Representing the collective interests of nearly 1500 Dutch gardeners and landscapers, the department is committed to promote roofgardens and living walls in the Netherlands. Albert Jan’s portfolio of International Relations enables him to maintain contact with overseas specialists, thus enforcing the position of the association as independent authority. Albert Jan has a degree in mechanical engineering and in land and water management.